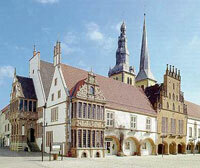 The city of Lemgo lies in the heart of the Lippe region of North Rhine Westphalia. It has a population of 43,000 and is located approximately 15km east of the Teutoberg Forest. During the period of the Hansa, Lemgo was bustling with life. This tradition is maintained to this day during the weekly markets that attract locals to the lovely market square on Wednesdays and Saturdays. The "The Stone Hall", as the market square of Lemgo is called is a great place to meet and experience the rich culture that Lemgo has to offer. During the summer, the market square is often filled with people participating in the "Sommertreff", which is marked by various outdoor cultural events. Kläschen, a typical Lemgo holiday begins every year on the first Thursday of December. It is celebrated with a Christmas market in the city center and a fair at Regenstor Square. This celebration is not only enjoyed by the residents of Lemgo, but also by the residents of neighbouring communities. Sports fans will feel quite at home in Lemgo. Notable Lemgo teams include the Federal Handball League team TBV Lemgo as well as its national champion Artistic cycling team. The youth and students of the Ostwestfalen-Lippe University of Applied Sciences with a colourful assortment of bands and musical events. For those interested in culture, Lemgo offers many museums, concerts and readings as well as the performaces of the independent theatre company "Stattgespräch"..